Calf Support for Ocean shower chairs: This will replace the foot support on the chair. It is height adjustable in the hanger using the blue clip. The pad can be slid along the lower tube for best length. The lower tube is angle adjustable to the plane of the seat. The assembly will swing away for transfers. 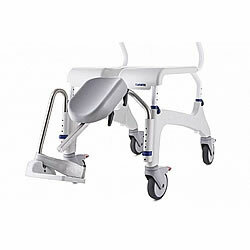 Calf Support with Foot Plate for Ocean shower chairs: also known as elevated leg rest. This will replace the foot support on the chair. The height will be adjusted with the blue clip from the foot support. A pad can slide along the lower tube to adjust length from seat, while the lower tube assembly is also angle adjustable to the plane of the seat. The foot plate has a heel loop.